It was time to break out with the big canvas. As a student visiting the Musée de l’Orangerie in Paris, I’d just seen Monet’s monumental Water Lily paintings and I was in awe. The sheer scale of the pieces with thick painterly brush strokes inspired me to get back to my little studio space at home. I wanted to create impressionistic landscapes and seascapes that still held the qualities of light-fall and realism that I’d seen, but maybe a little bit smaller than 40ft! And this immersive large-scale painting experience is what many beginner artists want, it feels exciting and well….arty to create something big and expressive. Grabbing a large decorators brush, making gestural marks on your canvas – feels invigorating, almost like a breakthrough and then…. you start to hear your inner artist voice getting overwhelmed. You haven’t got a plan, you don’t know what the next step is so you lose your nerve. You don’t know how to finish the painting and more often than not you revert back to a small canvas because it feels safe. In this course, learn the key techniques for moving from small-scale to large-scale paintings with acrylics whilst still achieving a painterly style. Over 4 hours of tuition, you’ll observe fabulous lighting conditions and colour harmony of a beautifully lit skyline by completing a large, impressionistic studio painting of Venice, Italy. You’ll be guided through the basics of working with acrylic paint, review different brushes and materials, add texture to the surface of your canvas, mix pastel base colours, loosen your brushstrokes and accurately capture architecture in your drawings. 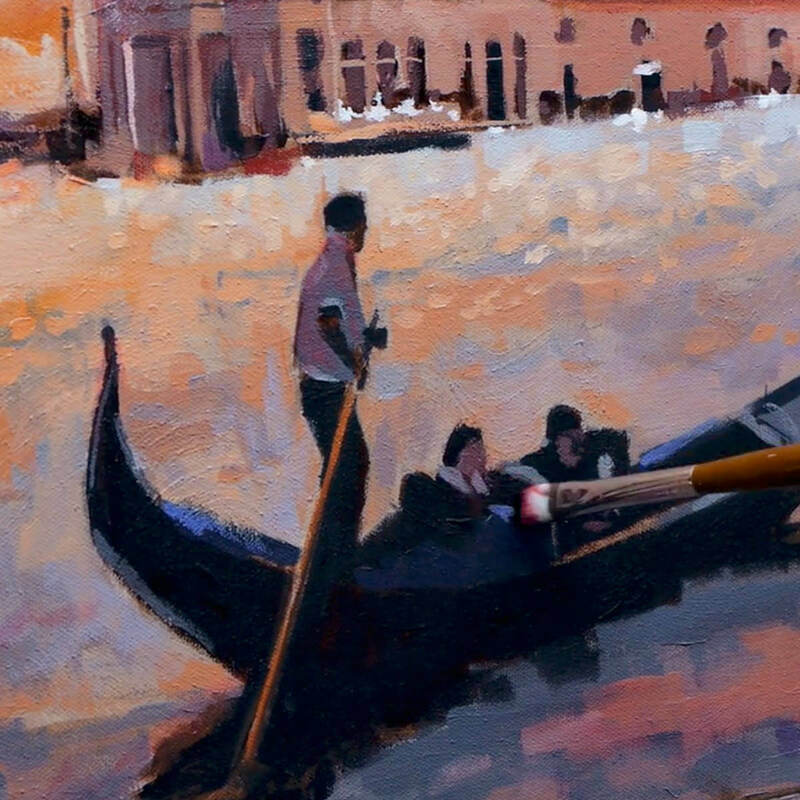 The silhouette of the gondola, the warmth of the sun setting behind the Basilica and the dappled light reflecting off the water, allows us to capture the colour and light of a Venetian scene. When I first started painting large-scale canvases, I had the luxury of free expression, a paint-splattered studio and no-one to please but myself – I had a ball! But the experience of this much-anticipated freedom when working larger scale actually started to have a negative effect on my creations. I couldn’t seem to get what I wanted on the canvas quick enough. As the size of the canvas increased, areas I was used to changing with one brushstroke, seemed to take ages. I’d run out of paint, then have to mix some more and spend hours fighting against the quick drying times of acrylics. The paintings either looked great up close to the canvas or great from right across the studio, but getting that balance between the two was hard. So, what was the key to going from small-scale to large-scale and achieving a landscape that captures the atmosphere of the scene in a painterly style? It came down to something far less exciting. 1. If the paintings tonal values (black, whites and greys) on a small scale didn’t work, the bigger scale painting didn’t work. 2. If I planned a colour harmony before I began, I could be more expressive with my mark making knowing there was an underlying backbone that worked. 3. Spending time getting the drawing laid out was always worth it – even though I was aiming for an impressionistic painting style. 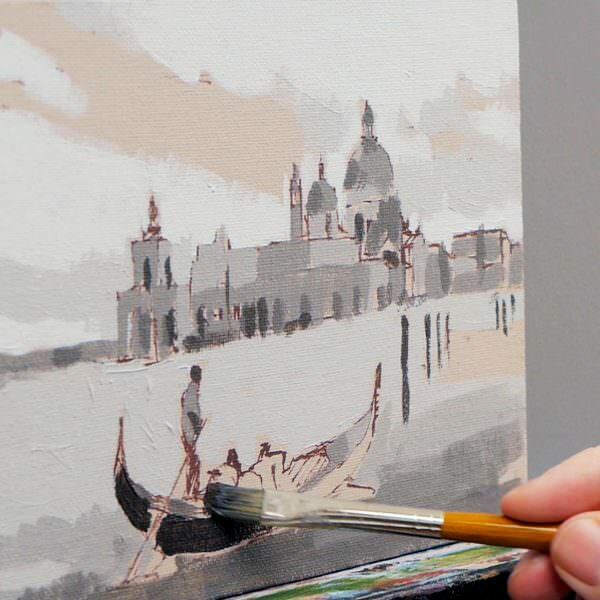 I’ve developed this painting course inspired by a Venetian Sunset to help guide you through the process of moving from small-scale to large-scale acrylic paintings. 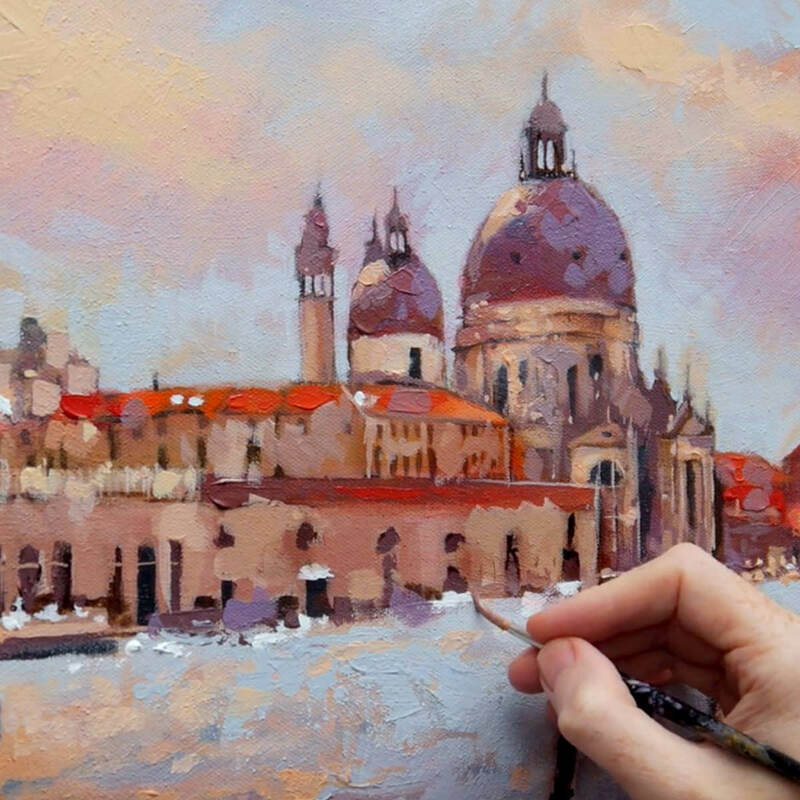 For me as a painter, there is nothing more exciting than the fabulous lighting conditions, amazing architecture and the warm pastel shades of the Venetian skyline. Observing the hidden tones, colour in the shadows and the vibrant reflected colours in the water lends itself to a broken colour Impressionistic style. 1 x large-scale finished painting of a Venice Sunset taking you step-by-step from drawing, right through to the final glazes. 3 x small supporting studies to practice your techniques and refine your vision. Downloadable jpeg reference images and drawing worksheets to work alongside from, including a mapped out grid for scaling up your drawing, black and white printouts and a full materials list. Over 4 hours of detailed video instruction. An introduction to the materials, paints, surfaces, brush-strokes and mark-making. Observe how different lighting within a landscape affects the colour temperature of a scene. Adding surface texture onto the canvas enables looser brush handling and broken edges. Understanding the importance of accurate drawing and scale when handling architecture, even when painting in an impressionistic style. Practicing new techniques on small tonal posters studies before committing to the larger scale piece to build confidence. Increasing perception using the power of the ‘planes of the landscape’ and how they help avoid distraction. Transforming complicated views into a simple design by shadow blocking. Learn how using a limited palette saves you endless amounts of painting time. Using large flat brushes and a soft pastel palette to block in your base colours to the sky and sea. How to overcome the rapid drying time of acrylics when painting big by using specialist acrylic mediums that ‘open-time’, smoothing edges and the importance of blending acrylics. 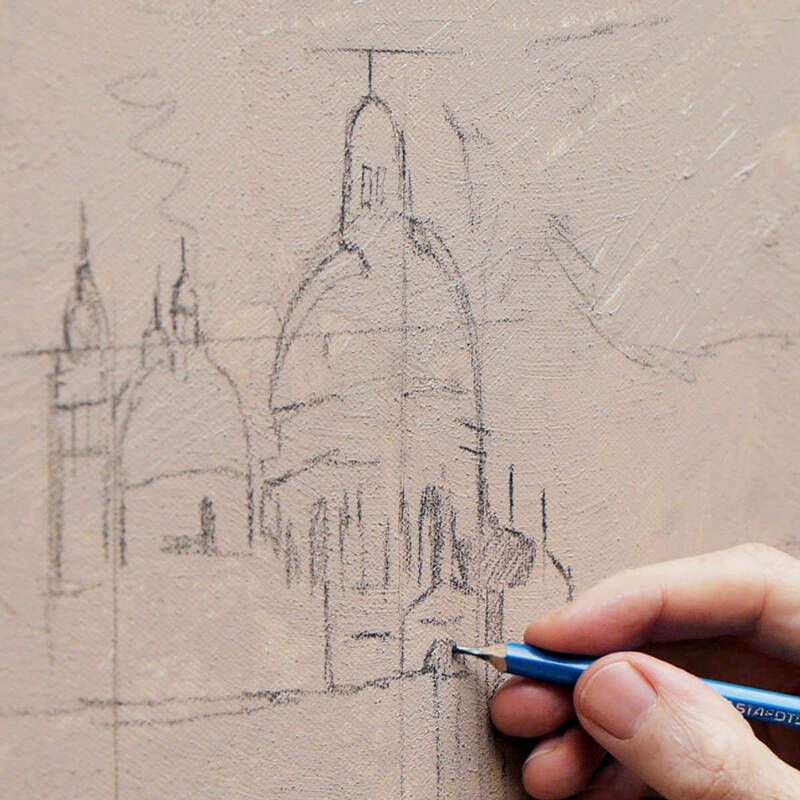 Introducing the rigger brush to add super smooth fine lines for architectural detail. Extending the colour palette with brighter pigments to increase the saturation and push the hues in the rooftops. Thinking abstractly to create impressionistic brush-marks in the water, bringing together the sky and sea. How glazing can add atmosphere, mood and inject a warmth and glow. 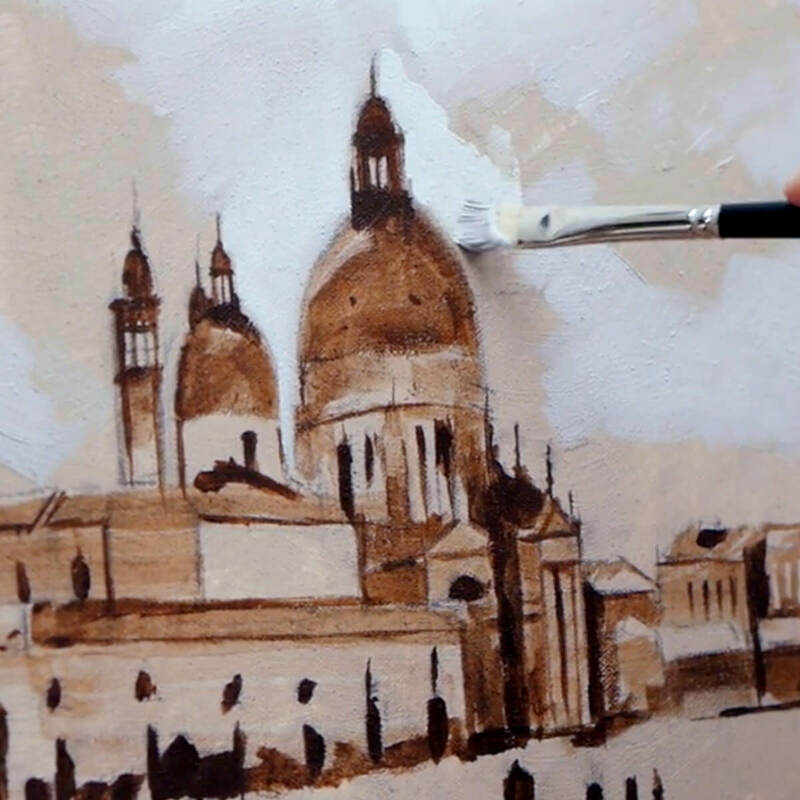 Adding further details to the architectural elements in the painting using finer brushes. Looking at the smaller shapes on the gondola, architecture & clouds. Using a palette knife to add texture and an impressionistic flair. Refining our colour mixes, checking our drawing and seeing how the painting works together as a whole. Adding clean dashes of colour to create the ‘silhouette effect’ bringing the viewers attention to certain parts of the painting. I’ve taken care to film everything from my perspective so you can see exactly what I’m doing as we go through the entire painting process in real-time. With over 4 hours of video instruction, full-color photographs and drawing guides. When you purchase the course, you will receive an email with all the downloadable video links to the course. You then have to download and save the Video Lessons onto your home computer/iPad. 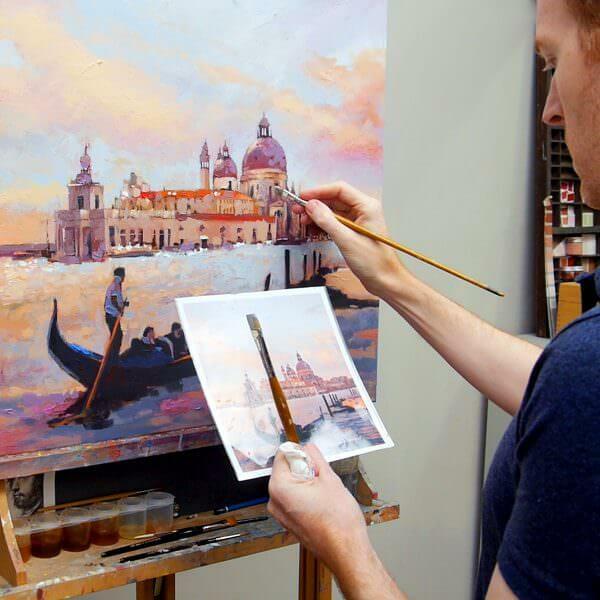 Go through each lesson in your own time and in the way you prefer, with smaller studies and challenges throughout the course to keep your larger painting fresh. 8 Downloadable Step-by-Step Video Lessons – over 4 hours + of video instruction that once downloaded – you have any time, anywhere, lifetime access. JPEG reference images used throughout the course, including the photo reference I demo with and copies of my line drawings. The video files are large (3.5GB) so you need a broadband internet connection and enough space on your computer hard drive. A broadband internet connection – the files sizes for the video lessons are quite large (3.5GB in total) so can take a while to initially download (depending on your internet speed.) Once downloaded, they are yours to keep forever, watch without buffering or take to the garden and watch away from an internet connection! A love of espresso! – optional but you might need a biscotti or two! Thank you, Will! I’ve downloaded the videos … now off the grab a brew and start painting! I have to let you know that you are simply the best teacher when it comes to your art classes. I can’t find another source of online instruction that gives as much clear, step by step information as you do. Plus you have SO MANY FREE videos! Thank you thank you thank you! This aspiring artist is so grateful for your generosity. I am sure I’m in over my head with this new class but I’m gonna just go for it. This is a great course. I especially like how in-depth this course is and all of the exercises that you include. I’ve completed the first three videos and just finished spraying fixative on the canvas. I’ve done all my art study on the internet and your courses are by far the best I’ve taken. All the best. Aloha, Will! Mahalo (Thank you) for your wonderful course. I studied the photos and lessons over and over, watched how you did your paint mixes, used the grid method and transferred my drawings to an 11×14 and 16×20 canvas for the main painting. Except for the W&N pale umber which I purchased, I mixed all of my base colors, substituting for red oxide and violet oxide ( I had yellow oxide) and value mixes. You packed a lot in this art adventure and from your excellent demonstrations and teaching tips, I would recommend your fine course to any serious art student. Thanks to your patient and painstaking teaching, I now have my Italian experience with two beautiful pieces of art! Let me know when we can travel together again! Will the painting take much more time than my smaller studies? Yes, it’s not all tea and biscuits when painting a larger scale for the first time! and there will be some parts during the process that seem to be taking longer than you may have experienced before when painting small. That’s absolutely normal, for every artist. Michelangelo spent four years perched on scaffolding when painting the Sistine Chapel, so a few more hours for this larger scale is to be expected. Do I need an upright easel? Ideally, yes, or a very high table top to place your canvas onto. One of the most common mistakes when starting to paint on a larger scale in keeping yourself too close to the painting surface. Physical distance (stepping back and forth) is much easier when standing at an easel. If you have difficulty standing for long periods, you can still work seated and even tweak the size from 24-inch x 24-inch to 16-inch x 16-inch to make it more comfortable. Will I need more patience? Yes, when trying anything for the first time there are going to be areas that are frustrating. Just don’t be too hard on yourself, it happens to the greats. Even Monet had his moments. Just before 15 of his Water Lilies went to an exhibition in Paris, he was so unhappy with his work, rather than have them on public display, he destroyed them! I paint with oils, can this course be applied to oils? In theory, yes, although the first ground preparation stages are easier with acrylics and you would have to wait longer in between sections when working on the glazing parts of the piece. Many of the pigments I use are also available in oil colours but I don’t reference any mediums or list oil alternatives in the course. You could follow along with OPEN acrylics by swapping the first under-painting with standard acrylics and then working with the OPEN paints. Again, when we get to the glazing stages you’d have to wait much longer in-between paint applications and the thicker impasto sections would also take much longer to dry. For the initial ground, I’d use acrylics. You could then use water-mixable oils but would have to wait longer in-between sections when working on the glazing parts of the piece.